I want to preface this post by saying that this is a work in progress and that more info such as tools you will need, picture examples, links and details regarding wiring up the triggers will be added in the very near future. Warning!! I will take no responsibility for what you choose to do with your controller and what your outcome may be. Many people will probably ruin solder points, cut traces, short out boards and this and any unforeseen damage or loss of property is solely the responsibility of the owner. I will not be held accountable for anything I say on this page explicitly or implicitly telling you how to perform this modification to your Xbox One Controller. If you understand the risks involved (including, but not limited to, ruining your controller or other property, personal injury or anything stemming from this activity) and take sole responsibility for your actions, you may continue to read. Otherwise stop here and click THIS LINK where you can buy your own Xbox One Joystick. Just having the right tools is not necessarily enough though. You also need to have a basic understanding of how circuits work on a very simple level (open circuit vs closed circuit; continuity; etc. ), experience soldering (check youtube and the internet for tutorials AND practice! Practice, Practice, Practice on some old circuit boards out of anything that is junk laying around the house. Old TV remotes, old game controllers, etc. If you don't know how to solder be prepared to ruin a few PCB's) and I STRONGLY urge you to read as much as possible about joysticks, buttons, PCB's, etc. on SlagCoin.com as it all pertains directly to everything I will discuss from here on out. Follow the directions as provided in this embedded YouTube video. Once the PCB has been removed, peel away the clear, circular film covering the contact points for the D-pad. Also, be sure that you desoldered (or cut, very close) the wires from the rumble motors and trigger feedback. After peeling away the plastic covering the d-pad and desoldering the wires connecting the rumble motors and the haptic feedback from the triggers it is time to prepare our solder points. Using a razor blade, GENTLY scrape away the black, carbon film revealing the copper pad beneath as shown in the picture above for the following signals: Up, Down, Left, Right, Back (or whatever they are calling it now), Xbox Home, Start (now known as menu), A, X, Y. Use the same method to prepare the solder point for the B button's signal which is found on the second PCB and is shown in the picture below. Note: You should only be scraping an area about the size of the red dot (not the red line) showing each signal point in the picture and make sure you get these AS CLEAN AS POSSIBLE. I don't want to discuss in detail how to solder. There are likely thousands of videos and tutorials out there for that. Instead we will be discussing the best method to solder to this specific PCB. Start by applying flux to the copper pads that you have now scraped clean in part II of this post. Go ahead and tin each spot that you scraped and applied flux to as well as the signal points for LB, RB and a Ground signal (all shown in the picture below). I will get to the triggers last and you will need to tin those spots as well. Note: As you are soldering your wires to the PCB, stop occasionally to plug your PCB into a PC or your Xbox One and test the connection that you just made. If you touch the quick connect or exposed wire at the end of your wire soldered to a signal to a wire soldered to GND it should cause the same effect as if you had pressed that button on a brand new out of the box Xbox One controller. If one of your signals does not work back track and probe around with a multimeter and try to find out where the problem lies. Go ahead and strip and tin both sides of a length of wire for each point you need to solder to (add 4 more lengths of wire if you plan to also hook up both Triggers). I may be getting ahead of myself here a little bit but if you are going to be using this PCB as the only PCB in your joystick set-up and aren't running the wires to a barrier strip but instead are hooking up the PCB directly to the buttons and joystick switches go ahead and crimp or solder a .110 Female Quick Connect onto the end of the wire that will be connecting to A, B, X, Y, LB, RB, Start/Menu, Guide/Home and Back. Once you have stripped and tinned the other end go ahead and solder the tinned wire to the spots on the PCB that you have tinned for the corresponding button. If you are turning an existing joystick into a stick SOLELY for Xbox One you can solder the wires connected to the current buttons to their respective spot on the Xbox One PCB. Regarding the joystick and directional signals: you will probably solder the wires from the joystick harness directly to the PCB if your stick has PCB mounted microswitches and a 5 wire harness you can strip, tin and solder the wires for Up, Down, Left and Right directly to their corresponding spots on the PCB and the GND wire from the joystick harness can connect to any GND signal on the Xbox One PCB, preferably the one next to the LB Signal. You will probably want to solder an additional GND wire to the GND signal aside from the one in the 5 pin harness from the joystick. This other GND wire will serve as the ground for each and every button in your joystick (more on that in a bit). If your joystick doesn't have a wire harness and instead has individual, standalone microswitches you will need to prepare a length of wire with the appropriate size Quick Connect on one end and the other end stripped and tinned. Likewise, go ahead and Solder 1 wire from each microswitch to its appropriate signal on the PCB. V. So What About the Ground Wires?? 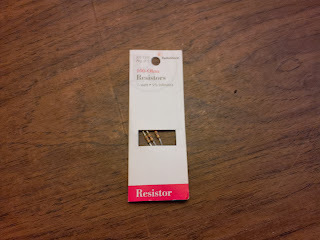 For hooking up the Left and Right triggers you will need two 1/4 watt 100 ohm resistors. They are very cheap and can be purchased from Radio Shack and most other electronic type hobby stores. 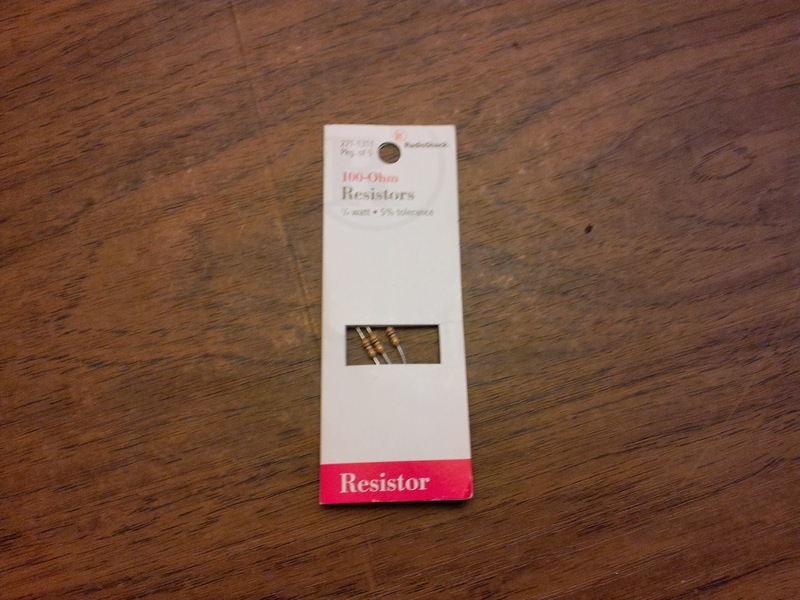 Prepare your wire with a quick connect to hook up to the designated button but solder the other end of the wire to one of the metals legs coming off of the resistor you purchased. Solder another wire to the other leg of the resistor and secure the resistor in electrical tape or heat shrink tubing. Connect the other end of the wire to the backside of the smaller PCB from the Xbox One controller to the spot marked in the picture below (1 wire per signal. each wire must have a 100 ohm resistor in line). Once every button has a ground wire hooked up to one of its two connectors and the correct signal for the other connector and the 5 pin wire harness from the joystick lever has been connected to Up, Down, Left, Right and Ground (per the respective wire) you can plug your Micro USB cable into the top of the Xbox One PCB and hook it up to your console and test everything out. Be sure to properly mount and secure your PCB in your joystick enclosure. I recommend using small ceramic stand-off's to mount the PCB and you may want to put a zip tie or two around both circuit boards to help insure they stay together. Using a hot glue gun to encapsulate your solder point and secure the wires to the PCB will help keep your solder points from breaking or possibly tearing off an entire copper pad. Do you have to have the setup like yours with 2 USB cords? Micro-B/USB 2.0 to Neutrik to Male A-B/USB 2.0? Or, can you use just a 10ft. cord straight from controller to XBox One system? Does it make a difference? Please let me know. Either way works. Makes no difference. The neutrik is nothing more than a plug, works just like a cable extension. Hooking up straight from the pad is fine. Thanks for putting this together.. help out alot!! question, do you have to connect the stick via a usb? cant you use it wirelessly? Xbox One Wireless Controller is the primary controller for the Microsoft Xbox One console. Buy Online & experience the action like never before with the Xbox One Controller.